Airbus A321LR Flew For Over 4,100nm The Longest Flight. 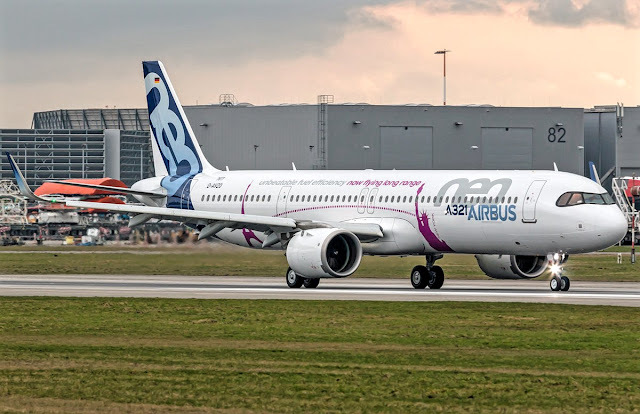 The Airbus A321LR test plane has returned to Toulouse after making its longest flight so far in the certification campaign, which operates from the Seychelles. The aircraft (D-AVZO) landed at the aircraft's headquarters just before 06:00 on March 30, after an almost 11-hour flight from the island of Mahe in the Indian Ocean territory. The aircraft was equipped with the three additional central tanks. Configured with the equivalent of 162 passengers and transporting five crewmembers and 11 technicians, the plane left the Seychelles around 9:00 pm on March 29. The route of the great circle between origin and destination is just over 4,100nm. Airbus says its flight test engineers have calculated, when factors including adverse road winds are taken into account, that the aircraft actually flew 4,700nm. His route took him over Ethiopia and Egypt, before the plane headed northwest of Toulouse upon reaching the Mediterranean Sea. "Everything was perfect," says the airframe-man. The flight was designed to test the cockpit and fuel management systems on the CFM International Leap-1A aircraft. Airbus says the A321LR, which recently underwent hot-weather testing in Sharjah, will fly shortly to Kiruna in Sweden, in a maximum takeoff weight setting, for another cold-weather tests.